New spectrum analyzers offer high-speed analysis for lab and production, ideal for 5G NR. 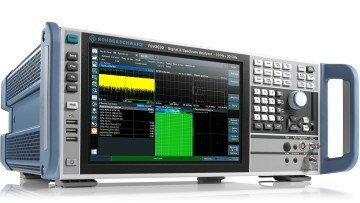 Rohde & Schwarz is launching two new signal and spectrum analyzer families, with different frequency models covering up to 44 GHz. The R&S FSV3000 is designed to help users set up complex measurements in the simplest and fastest way possible. With its easy usability and high measurement speed, it is the right instrument for labs and production lines. It provides up to 200 MHz analysis bandwidth – enough to capture and analyze, for example, two 5G NR carriers at once. The R&S FSVA3000, with up to 400 MHz analysis bandwidth, a high dynamic range and an outstanding phase noise of –120 dBc/Hz, delivers performance that was, until recently, reserved for high-end instruments. It enables users to perform highly demanding measurement applications such as linearizing power amplifiers, capturing short events and characterizing frequency agile signals. Both the R&S FSV3000 and R&S FSVA3000 can measure EVM values better than 1 % for a 100 MHz signal at 28 GHz. Together with the coverage of the 5G NR frequency bands up to 44 GHz, this makes the analyzers ideal for analyzing 5G NR signals. The R&S FSV3000 and the R&S FSVA3000 spectrum analyzers simplify troubleshooting rare events and setting up complex measurements. With the event based action GUI, whenever a predetermined event occurs the corresponding action, such as saving a screenshot or I/Q data, is performed. Auto measurements shorten the setup time of the instrument itself. At the press of a button, parameters such as center frequency, span and amplitude reference are automatically set based on the applied signal, and in the case of a pulse signal, the gate sweep parameters are set. For standard-compliant measurements such as ACLR or SEM, the auto measurement feature selects the corresponding standard parameter table. In scenarios with automated production lines with complex measurements, external computers can take over the control of the instruments via SCPI commands. Furthermore, the embedded SCPI recorder makes it much easier to create executable scripts, since all manual input is translated into plain SCPI or into the syntax of common programming languages or tools such as C++, Python or MATLAB©. The R&S FSV3000 and the R&S FSVA3000 spectrum analyzers provide a smart signal generator control that assists in RF measurement setups containing a signal generator from Rohde & Schwarz. Changes in the analyzer settings are directly taken over by the generator, and the analyzer can even display the user interface of the generator so that users can operate the complete setup from one screen. SCPI recording functions of the analyzer and the generator can be coupled. The R&S FSV3000 and R&S FSVA3000 are designed for high-speed performance in automated test systems. Both perfectly interact with cloud based processing. The optional 10 Gbit/s LAN interface enables I/Q data transfer toward the network end even at high sample rates, which is required for wideband signal analysis such as for 5G.